THE SCIENCE IS CLEAR: Anti-LGBT stigma and discrimination destroys lives and kills, from identity-based suicide and murder, to debilitating depression, anxiety, and daily fear. Known as "Minority Stress" - health experts from the ﻿American Psychological Association﻿, The U.S. Dept. of Health, The U.S. Commission on Civil Rights, U.S. Surgeon General, and many others, know the harm we endure, and have long-called for non-discrimination protections as the antidote to reverse the stigma and end the suffering. The facts below tell the story we need to tell the world. 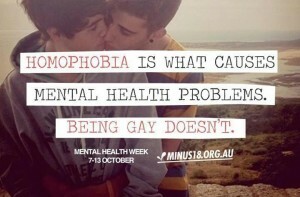 Homophobia and transphobia is abuse. Anti-LGBT preaching and political attacks are abuse. Discrimination is abuse. 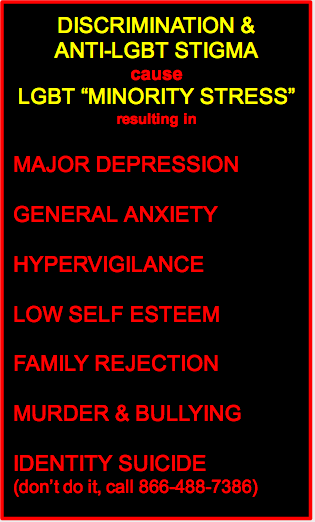 What other minority has its children committing suicide because society rejects them? Learn More & Find Support. 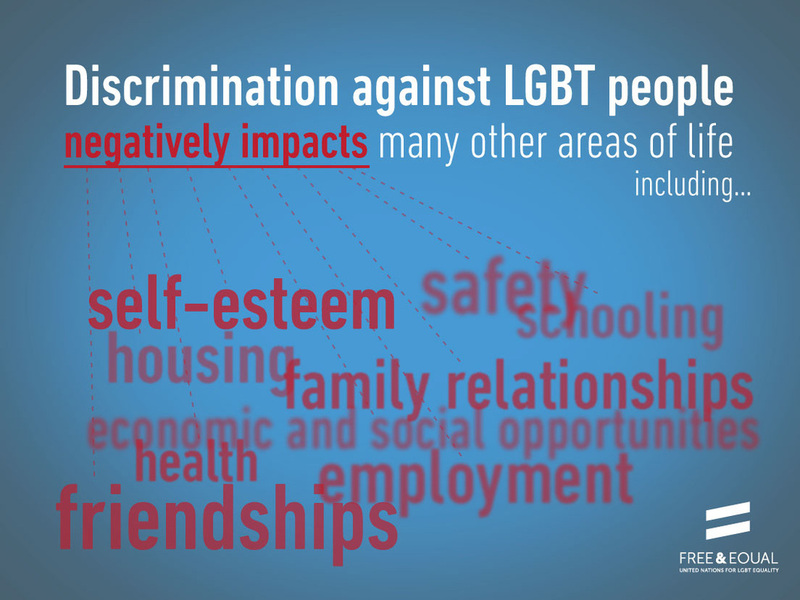 A central message of The Equality Pledge Network's campaign will be to tell the truth about how discrimination causes severe harm to the LGBT community, in order to help LGBT people understand our suffering in context, and to make it clear to Congress that this a public health emergency. 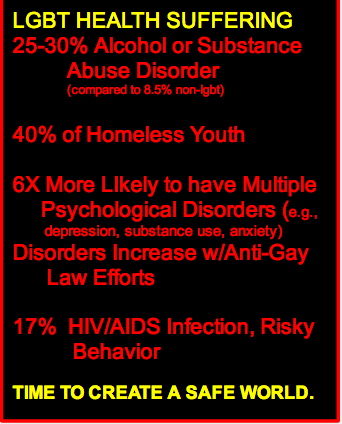 We will host a campaign for community-created PSA campaigns and create our own to make LGBT people aware of the psychological harms caused by this societal abuse (detailed below), to help liberate ourselves from the symptoms we endure, often unaware of the external causation. 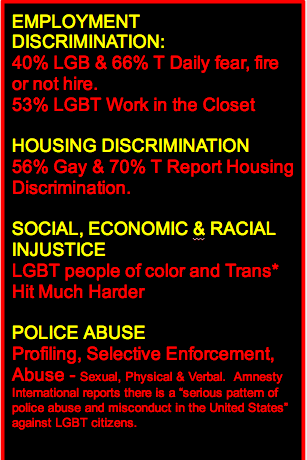 The facts reveal how so many struggle with generalized social anxiety, depression, relationship disassociation, family neglect, and daily fear at school, at home, and at work, where in 2014, over 50% of LGBT Americans are still in the closet! With this awareness, the only humane path is to outlaw SO/GI discrimination nationwide and immediately - as a public health emergency and human rights imperative. Right? Please learn what the scientists and United Nations are saying about the abuse of roughly 10% of humanity. And help spread the word. 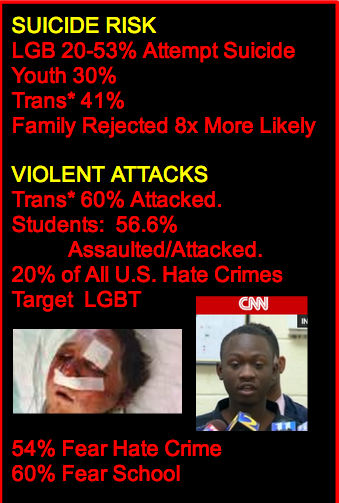 Homo-transphobia kills and destroys lives and happiness. And it must end. Want to help tell this story? Enter our Make-A-PSA competition to spread the info on this page and call for full LGBT civil rights protections as a human rights imperative and public health emergency. 30 sec., 1 min., or Print Ad. The PSA Campaign will target LGBT media and broadcasts, and will also be used to make the broader American public and legislators aware of the horrible harm being inflicted on fellow citizens. OUR "MINORITY STRESS" PSA CAMPAIGN. LEARN & SHARE THE FACTS. Your donation here will directly fund media ad costs for "minority stress" PSA spots on TV, social media, print, radio, etc. All funds go solely to costs of buying ads space, or conducting the PSA competition, as you choose below. TAKE THE PLEDGE. OUTLAW THE DISCRIMINATION.